S0688. JOSEPH FUCHS, w.Artur Balsam (Pf. ): Sonata in b, Op.1, #3 (Veracini); Fantasia in C, D.934, Op.159 (Schubert); Violin Sonata in a (Vaughan Williams); Rondo Papageno (Ernst); Romance sans paroles, Op.62, #1 (Mendelssohn). (Canada) St Laurent Studio YSL T-334, Live Performance, 17 Nov., 1969, Carnegie Hall. [Excellent sound in the Carnegie Hall acoustic, recorded on an Uher recorder with Sennheiser mike from a choice location in the Hall, far from audience members, virtually unmarred by audience noise.] Transfers by Yves St Laurent. 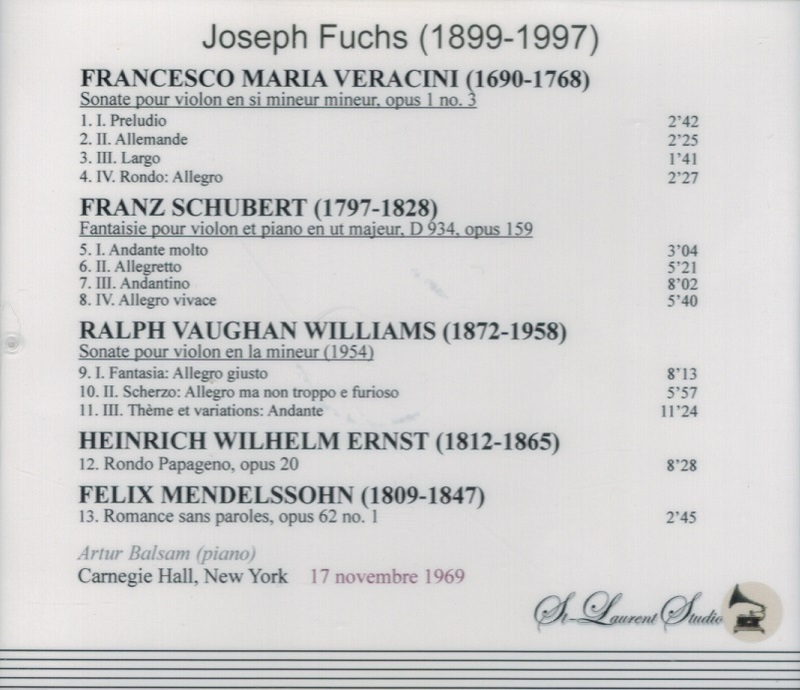 “It was unfortunate for Fuchs that he played at a time when active violinists included Heifetz, Kreisler, Elman, Milstein, Stern, Oistrakh, Kogan, Francescatti, and a great many others. Fuchs may have lacked the flash and charisma of some of his contemporaries, and he also spent 14 years as concertmaster of the Cleveland Orchestra (1926-1940) before truly pursuing a solo career. And he also devoted much of his time to teaching at the Juilliard School. For all of those reasons, he never achieved the popularity among general audiences of a number of his contemporaries. But he was greatly admired by his peers, by professional musicians of all stripes. He also was an advocate for new music, much more so than many of his colleagues, commissioning and premiering works throughout his career. After leaving the Cleveland Orchestra he was first violinist of the Primrose Quartet (Josef Gingold, William Primrose, and Harvey Shapiro being the remaining players) from 1941-43, made a solo début in Carnegie Hall in 1943, and began touring Europe, Asia, and the U.S. extensively. Fuchs played well, even in his late years. He was born in 1899, so [all these YSL] recitals were given when he was in his early seventies. [They] show him with undiminished technical skills and with great imagination in a huge range of repertoire....They document the playing one of the important violinists of the twentieth century, caught in actual performances that demonstrate the breadth of his musical sensibilities. 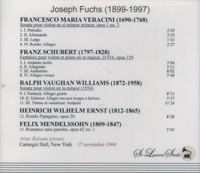 I heard Fuchs play in concert, and have heard studio recordings of his, and the one problem here is that the issue of recorded balance does not do justice to his tone, which even in the early 1970s was still richer than what comes across these discs. But we should still be grateful for their existence, because they document one of the masters of the violin of the middle and late 20th century in performance, and lovers of the instrument will surely want to obtain these. He often appeared in concert with his sister, Lillian Fuchs, a violist. 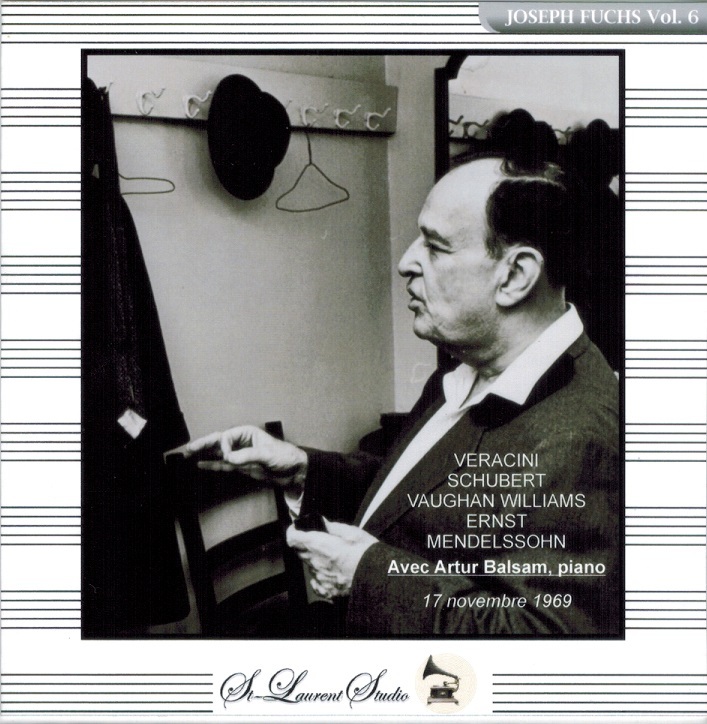 Mr. Fuchs also collaborated regularly with the pianist Artur Balsam and the cellist Leonard Rose. Mr. Fuchs was a founding member of the Musicians Guild, a chamber music organization that presented many concerts during the 1940s and 50s. A true upholder of the Kneisel tradition, he called chamber music his 'true love’. He became a professor of violin at the Juilliard School in 1946 and held the position until his death. He was a founder of the Blue Hill Music School in Maine in 1953, a summer program that evolved into the Summer Chamber Music Institute at Alfred University in Alfred, N.Y.